Three men arrested for felony assault charges stemming from a fight in a Laguna Beach bar where three patrons were hurt pleaded not guilty in Orange County Superior Court earlier this month. The suspected combatants, who are all friends, were identified as Jeremy Melvin Bishop, 36, of Ontario, Calif., and Daniel Keith, 27, and Joshua Tyler Little, 23, of Prescott Valley, Ariz. They were arrested Jan. 31 and turned themselves into Harbor Court, Sgt. Jim Cota said. Bishop was arrested at the police department. Police said officers responded Aug. 11, 2017, to a 1:30 a.m. pub brawl in the 400 block of South Coast Highway. Their investigation determined that three men assaulted two male patrons and a Good Samaritan female who tried to intervene. The men sustained broken bones and lacerations and the woman sustained minor injuries. Police plan DUI patrols this weekend beginning at 5 p.m. Sunday, Feb. 25. An alert about a vehicle whose passengers were described as armed and dangerous led to the arrest of two Long Beach men after they abandoned their car in North Laguna about 12:42 a.m. Clifton Young was located on Cedar Way in possession of a stun gun and Rylan Robinson was on Cliff Drive trying to enter an Uber. Masks, beanies, and hoodies were found in their vehicle. Traffic stop. 20600 block of Laguna Canyon Rd. 1:47 a.m. A Santa Ana woman, 48, was arrested for DUI. Traffic stop. 100 block of Cleo St. 12:33 a.m. A 35-year-old Tustin man was cited for DUI. Vehicle violation. Ocean Ave. 1:53 a.m. A 39-year-old Mission Viejo man was cited for DUI after allegedly running a red light. Pedestrian stop. Glenneyre St. 4:35 p.m. Local transient Joseph Robert Kirkpatrick, 53, was arrested for felony vandalism after he allegedly kicked in a store window. Restraining order. 2400 block of Iris Way. 12:23 a.m. A Laguna Beach woman, 52, was cited for DUI after she allegedly violated a restraining order barring her from a property where she allegedly entered via its balcony. Occupied vehicle. 200 block of Park Avenue. 2:20 a.m. Four people were arrested who each had outstanding misdemeanor arrest warrants. Burglary. 31700 block of Coast Hwy. 4 a.m. A break-in to a business was reported after a passerby spotted a broken window. Suicide. Woodland Drive. 8:39 a.m. A resident reported finding the body of a man who had used a seatbelt to take his own life. Traffic stop. Park Avenue. 8 p.m. A Laguna Beach teen, 18, was cited for DUI. Domestic violence. 20600 block of Laguna Canyon Rd. 9:44 p.m. Anita Marie Novak, 28, of Michigan, was arrested for suspicion of felony domestic violence after her eight-month partner was scratched on the face and chest. Traffic stop. Forest Ave. 10:50 p.m. John Deleon Fernandez, 40, was arrested for suspicion of DUI and held for $10,000 bail due to a previous offense. License plate reader. 18-00522. 12:42 p.m. Kyle Nicholas, 34, of Laguna Beach, was arrested on a Snohomish County, Wash., warrant along with a new charge for possession of a stolen vehicle. Nicholas allegedly rented a rental car in October and never returned it. Bail was set at $20,000. Vehicle vs. pedestrian. Cress Street at Coast Hwy. 12:20 p.m. The front bumper of a car struck a woman crossing Coast Highway in a marked crosswalk. The pedestrian suffered bruises on her head, knee, upper back and face. Paramedics placed her in a neck brace before transporting her for treatment. Traffic stop. 300 block of Forest Ave. 1:29 a.m. A report about a wrong-way driver led to the arrest of a 39-year-old Mission Viejo woman for DUI. Property. 600 block of S. Coast Hwy. 2:54 p.m. A gem artist unintentionally left a leather bag outside a gallery after closing up shop. Its $10,000 in contents included gem stones, tools, precious metal findings and wire. Burglary. 2700 block of Victoria Dr. 10:22 p.m. A resident’s security camera has images of a subject attempting entry. Vehicle burglary. 300 block of Aster St. 6:46 p.m. 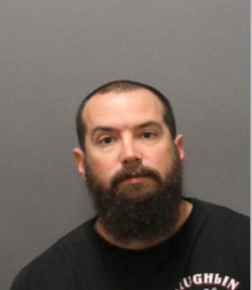 Following a report about a man taking small bills from a car, police arrested a 33-year-old Garden Grove man for theft.